Francisco Suárez (January 5, 1548 – September 25, 1617), known as “Doctor Eimius,” was a Spanish Jesuit philosopher and an eminent Roman Catholic classical theologian. Along with Roberto Bellarmine, he was one of the leading thinkers who defended Roman Catholic doctrine against the teachings of the Reformation. Suárez was the major scholastic philosopher of the Jesuits, whose aim was to reform the Catholic Church and counter the Protestant Reformers. After Thomas Aquinas, Suárez is considered one of the greatest medieval scholastic philosophers, and was the leading advocate of Jesuit doctrine. Suárez’s principal work, the Disputationes Metaphisicae (Metaphysical Disputations, 1597), challenged traditional scholastic views, and was the first systematic and extensive work of metaphysics composed in the West that was not a discourse on the metaphysics of Aristotle. His writings were widely studied by the thinkers of the seventeenth century and his concept of divine, natural, and human law influenced Hugo Grotius. His ideas were also significant in the early development of modern international law and the theory of just war. In an age of European imperialism, Suarez was one of the first to articulate a global legal system based on Christian tenets, which gave each nation equal value and certain sovereign rights. Suárez was born in 1548, the son of a prosperous lawyer, in the Spanish city of Granada. He began the study of law in Salamanca in 1561, but at the age of sixteen he left school to enter the Society of Jesus at Salamanca, and studied philosophy and theology there for five years, from 1565 to 1570. It appears that he was not a promising student at first; he failed the entrance exam twice and nearly gave up his thoughts of study. On his third attempt, he passed the exam, and he completed his course of study in philosophy with distinction, going on to study theology, then to teach philosophy at Ávila and Segovia. He was ordained in 1572, and taught theology at Ávila and Segovia (1575), Valladolid (1576), Rome (1580–1585), Alcalá (1585–1592), and Salamanca (1592–1597). In 1593 King Philip II of Spain selected him to teach as a professor at Coimbra (1597-1616). Suárez was an exceptional Jesuit, practicing a life of discipline, diligence, humility and prayer. Pope Gregory XIII was present at his first lecture in Rome. Pope Paul V invited Suárez to refute the errors of James I of England, and wished to retain him near his person, to profit by his knowledge. When Suárez visited the University of Barcelona, the doctors of the university went out to meet him wearing the insignia of their university faculties. He wrote on a wide variety of subjects, producing a vast amount of work (his complete works in Latin amount to twenty-six volumes). Suárez's writings include treatises on law, the relationship between church and state, metaphysics, and theology. After his death in Portugal (in either Lisbon or Coimbra) his reputation continued to grow, and he had a direct influence on such leading philosophers as Hugo Grotius, René Descartes, and Gottfried Leibniz. Catholic and Protestant thinkers both researched the philosophies of antiquity, seeking to reconcile their concept of the supremacy of God with human freedom, responsibility and grace. These were crucial topics of debate during the Renaissance and the Religious Reformation. There were inquiries into the different theories about God’s omnipotence and omniscience. One line of inquiry concerned the extent of the dominion and power of God, the other concerned God’s foreknowledge of events. If God is the Supreme Ruler and Creator, is He the Cause of everything, even the movements of every tiny creature, and of human events, such as wars and conflicts? Are humans able to make any choices about their actions, or is human freedom just an illusion? If God is all-knowing, can He know all events in advance, because He causes them to occur? Or does God comprehend events only as they occur? These had been problems of philosophy for centuries; during the sixteenth century these debates flared up again among the Catholic religious orders, and then among the Protestants. The Dominican Order and Jesuits (the Society of Jesus) followed Thomas Aquinas and held Aristotle in high regard. Thomas Aquinas supported the theory of St. Augustine on the question of predestination. As Renaissance thought began to spread the concept of human autonomy, the Jesuit philosophers modified the theories of Thomas Aquinas to temper divine determinism and allow for some kind of human freedom and autonomy, while still upholding the supremacy of God. To resolve these controversies, Luis de Molina (1535-1600), a Spanish Jesuit philosopher, developed the doctrine of "middle knowledge" (scintia media), which preserved human free will while upholding the doctrine of divine grace. God has foreknowledge of how a human will choose to act in every situation; neither that knowledge nor God’s grace define human free will. Molina asserted that the grace of God becomes effective as human will freely cooperates with it. His doctrine of middle knowledge resembles a dress rehearsal in which humans exercise different parts before they play them. Knowing how people, exercising their free will, will choose to act, God chooses to effect what He has already foreseen. 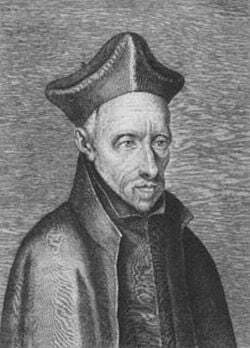 The leading opponent of Molina’s theory was the Spanish Dominican Domingo Banez (1528-1604), a Thomist who criticized Molina for making the force of divine grace subordinate to the human free will. Francisco Suárez expanded on Molina’s theory and presented the concept of "congruism." God does not produce the free acts of humans. God realizes the salvation of the chosen people by giving them grace in the measure which He foresees will be in harmony with their own will. The style of Suárez’s writing was closer to Renaissance thinking than to medieval Scholasticism. By the end of the sixteenth century the philosophical disagreements between the Dominicans and the Jesuits had become bitter. Francisco Suárez’s most significant work is the “Disputationes Metaphysicae” (1597), which was used as a textbook in both Catholic and Protestant universities in Europe for more than a century. The book deals with human free will, the concept of being, the principle of individuation, universals, and the problem of good and evil. Suárez considered himself a follower of Thomas Aquinas, but there is a significant difference between the philosophies of Thomas Aquinas and Suárez. Suárez’s thought had an essentialist orientation, which he inherited from Avicenna and Duns Scotus, compared to Thomas Aquinas’ existential orientation. As for the nominalist realist debates, Suárez took a middle path between realm of Duns Scotus and nominalism of William of Ockham. His other great work, De Legibus (On Laws, 1612), explicated Suárez’s political theory and philosophy of law. He systematized Scholastic legal theories, and developed his theory based on Thomist legal and political thought. Suárez considered not only medieval law but the conditions predominating in society at the time he researched. Hugo Grotius (1583–1645), a jurist in the United Provinces (now the Netherlands) who is credited with being the founder of international law, is indebted to Suárez for his theory of natural law. Suárez's main importance stems from his work on natural law, and from his arguments concerning positive law and the status of a monarch. He argued against the sort of social-contract theory that became dominant among early-modern political philosophers such as Thomas Hobbes and John Locke, but some of his thinking found echoes in the more liberal, Lockean contract theorists. Human beings, argued Suárez, have a natural social nature bestowed upon them by God, and this includes the potential to make laws. When a political society is formed, therefore, its nature is chosen by the people involved, and they give their natural legislative power to their ruler. Because the people gave this power, they have the right to take it back, by revolting against a ruler, but only if the ruler behaves badly towards them; and they are obliged to act moderately and justly. In particular, the people must refrain from killing the ruler, no matter how tyrannical he may have become. If a government is imposed on people, on the other hand, they not only have the right to defend themselves by revolting against it, they are entitled to kill the tyrannical ruler. Pope Paul V asked Suárez to write apologetic works on the nature of the Christian state. De Virtute et Statu Religiois (1608-09) and Defensio Fidei Catholicae (1613) objected to the Anglican theologians who supported the kings’ claims that they ruled as God’s representatives on the earth. James I of England, who promoted the divine right of kings, burned Defensio Fidei Catholicae on the steps of St. Paul’s Cathedral in London. Suárez also argued that human beings had certain natural rights to life, liberty and property ownership. He rejected slavery, and in De Bello et de Indis (“On War and the Indies”) he criticized the Spanish colonization of the Indies, saying that each island should be regarded as a sovereign state, legally equal to Spain. A Commentary on Aristotle's Metaphysics: A Most Ample Index to the Metaphysics of Aristotle. Milwaukee, WI: Marquette University Press, 2004. Metaphysical Demonstration of the Existence of God. St. Augustine's Press, 2004. On Creation, Conservation, and Concurrence: Metaphysical Disputations 20, 21, and 22. St. Augustine's Press, 2002. On the Essence of Finite Being As Such, on the Essence of That Essence and Their Distinction. Milwaukee, WI: Marquette University Press, 1983. On Efficient Causality: Metaphysical Disputations 17, 18, and 19 (Yale Library of Medieval Philosophy Seri). New Haven, CT: Yale University Press, 1994. Selections from Three Works of Francisco Suárez. William S. Hein & Company, 1995. Blanchette, Oliva. "Suárez and the Latent Essentialism of Heidegger’s Fundamental Ontology." The Review of Metaphysics, September 1, 1999. Digital document. Gilson, E. Being and Some Philosophers. Toronto: Pontifical Institute of Medieval Studies, 1952. This page was last modified on 25 April 2017, at 14:47.